Back in 2011, I discovered my health was failing me. After spending 20 years in the corporate world leading and building a successful range of different business entities, I began to realize that I was also building life-threatening stresses that were leading down a road of a short life. Not being one to accept failures, I took charge of my health and turned it around. Exercise, nutrition, proper rest, and lowering stress became part of his daily life. Within 3 years, I made sweeping changes in my life. I am now healthy and active while experiencing lower stress. The most exciting thing that happened to him on this journey was rediscovering something I’d completely forgotten…I loved being an ATHLETE! What had begun with strength training and weight loss soon morphed into road-biking. I completed the MS150 Arkansas the last time it was held on the steep Petit Jean Mountains. Soon this renewed passion for an active life inspired running half marathons and that quickly led to running full marathons. I was becoming the athlete he loved. Always wanting to push myself outside of my comfort zone I took on a triathlon – and…WOW did I ever!!! I completed my 1st sprint triathlon in June 2011 and knew instantly that I had found my sport. I have now completed longer and ultra-distance triathlons, including full Ironman's. I love endurance sports, both training, and racing! So much so I established GPP Cycling & Multisport™ Bike Shop and GPP Endurance™ to facilitate in helping others find the support I was blessed to receive. I’m now positioned to pay it forward by helping others "Crank Up Life" and "Create the Capacity to Endure". In 2014, I became an Endurance coach and a Certified Bike Fitter allowing me to coach several triathletes to success in all triathlon distances including Full Ironmans. Every day I live my life incoherence to my favorite Jimmy Valvano quote, “Never Ever Give Up”. I am a Swim, Bike, Run-TRI geek. Huge NASCAR fan. I Love College Football & the Houston Astros. Can't get enough of Military & Alternate History! I am an owner of GPP Cycling Shop in Rogers, AR and GPP Endurance along with my business partners Mark Mohler and my wife, Kimberlie. I am currently working on my Ironman Coaching Certification as well. I'm married to my wife Kimberlie Dian and I have 4 grown children, 2 boys 2 girls, and a 2-year-old grandson. Big Weekend Accomplishment. 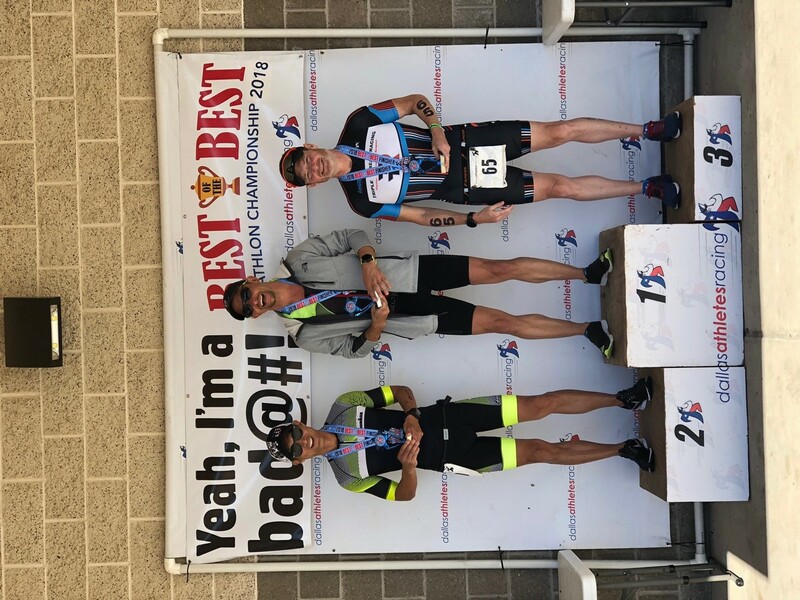 3rd Place AG M 45-49 at the Best of the Best Triathlon Championship in Dallas TX.